The ideal salad for a smart picnic – all you need to do is drizzle over the dressing before tucking in. Quantities can be easily doubled to serve more people. 1. Preheat the oven to 200 ̊C, gas mark 6. Line a baking tray with foil, add the salmon fillets, skin-side down, and season. Drizzle with a little oil, then roast for 15 minutes, until just cooked through. Set aside. 2. Meanwhile, put the eggs in a pan of cold water and bring to the boil. Reduce the heat, and simmer for 6 minutes. Drain and cool the eggs in cold water, then peel and halve. 3. To layer up the salad ready to transport, warm the lentils according to pack instructions, then tip into a bowl or tub. Toss with the olive oil and salad onions. 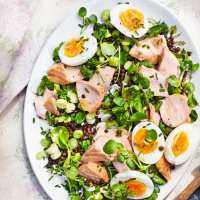 Flake the fish over the lentils, then add the eggs yolk- side-up and mound the watercress on top; seal and chill for up to 1 day. Mix all the dressing ingredients in a small, sterilised jar and season. To serve, pile the salad onto plates, shake the dressing, then pour it over.